"What the WI means to me"
The Women's Institute was formed in 1915 to revitalise rural communities and encourage women to become more involved in producing food during the First World War. Since then the organisation's aims have broadened and the WI is now the largest voluntary women's organisation in the UK. The WI celebrated its centenary in 2015. Sand Sculpture top celebrate 100 years of the W.I. To promote and strengthen the community life of Eglingham Civil Parish (“the Parish”)by producing and delivering free to every household, in the Parish, a news magazine with information and articles relevant to the Parish, without distinction of political, religious or other opinion. The organisation to be not for profit and to remain independent of any political or commercial enterprise. Every month, one of our WI members, Pat Ives, provides a summary of our meeting to be published in this magazine. Brenda opened the meeting and following normal business, gave a report from the annual council meeting of the Northumberland Federation of WIs, which had been held at the RGS in Newcastle. Two new members, Gil Ridgway and Jan Montgomery joined our group. Our speaker for April was Liz O’Donnell whose talk was entitled Hens That Want To Crow. She gave an interesting talk with slides about the struggle for votes and other campaigns of suffragists and suffragettes. She had done extensive research on the subject and it was very refreshing to hear about the women from the North East instead of what happened in London and the south of the country. Liz covered the period from 1866 to 1918, when the women turned their efforts to the war, finally getting the vote (at least for some) in 1928. This month’s raffle was won by Gill Rollings. Next month’s meeting on the 10 May will be the second of our centenary celebrations, when we will be joined by invited guests. On the 10 May we held the second of our centenary celebrations. In the village hall, beautifully decorated and with attractively laid tables, we were joined by around 30 invited guests. On arrival there was a glass of prosecco or non-alcoholic drink for everyone. Our president Brenda opened the evening by welcoming everyone and explained that the evening was in honour of Fiona Robson and that all the proceeds from the raffle and collection would be given to the Alnwick Oncology Unit and Wansbeck Palliative Care Unit where Fiona had her treatments. Andy Gray was busy taking photos of everyone, which will be incorporated into our centenary quilt. A delicious cold buffet supper had been prepared by members of the committee and whilst everyone was enjoying their food, pictures of WI activities and members past and present, were shown on the screen. Brenda had made a beautiful celebration cake and this was served to everyone, along with a glass of prosecco. We had booked a magician for the entertainment but he had been delayed at Rome airport and the person he had arranged to take his place did not turn up either. Apparently, he went to Ellingham instead! However, it did not seem to mar the evening. Hilary Robson, the President of Northumberland Federation of WIs, gave a vote of thanks saying how much she had enjoyed the evening. Prudence Marks also gave a vote of thanks. The raffle was drawn and the proceeds amounted to £283. Another successful evening to mark 100 years of Eglingham WI ! Our next meeting is on Thursday 14 June when our speaker is Susan Felton who will be talking about Canine Partners, a charity which transforms the lives of the disabled by training assistance dogs. July was the month for our Annual Meeting and Brenda opened the meeting by welcoming Jo Dickson a WI advisor. Judith then started the proceedings by giving her treasurer’s report for the year, stating, apart from other financial matters, that the banking can now be done online. Also highlighted was the fact that we had raised £1,000 for our nominated charities. Our members now numbered 31. It was then on to Gill, our secretary who gave an account of what we had been up to during the past year as regards speakers and outings etc. Brenda then gave her president’s report, thanking Gill and Judith for their support and also the committee. Special thanks was given to Carolyn who had arranged an excellent programme for the year and also her hard work involving the ‘centenary quilt’. The proceedings were overseen by Jo Dickson who then gave a brief history of the WI groups celebrating their centenary this year. She then took nominations for president and Brenda was once again elected for the coming year - a popular verdict. Jo was presented with a plant and Jill Archer gave a vote of thanks. Once again, a beautiful supper was to be had, this evening’s theme being party from the past. A very varied selection of food was on the table from marmite sandwiches and jelly sponges to a spectacular black forest gateau. The theme of our annual competition was to be in the WI colours of green, gold and purple and was won by Brenda. Previously in the month of June we had as our speaker Susan Felton who gave an inspirational talk about the work of assistance dogs who transform the lives of disabled persons. On that occasion Jane Hamilton, who herself is involved with dogs helping with therapy, gave a vote of thanks. Following our break in August we reconvened again on Thursday 13 September. Brenda opened the meeting and welcomed visitors from Cambo WI, Helen from the village and Jenny a new member. The minutes of our July meeting were approved and signed and the various matters arising discussed. Once the ‘official’ business had been concluded Brenda then introduced Ruhila Shahab, our speaker for the evening. Ruhila, who is from the Punjab region of India, was demonstrating cooking a chicken curry. Firstly, she talked about the various spices used in that region’s cooking and then proceeded to actually make the curry, answering questions from the floor at the same time. We sat watching whilst the spicy smells wafted around (reminded one of the old Bisto gravy ad). Cooking completed, bowls of the curry and rice were there as tasters- a medium spicy curry but very tasty. A vote of thanks was given by Jane Hamilton. Supper then followed and the raffle drawn. Our next meeting will be Thursday 11 October and Jane Graham will be talking about A Lively Heart. Two new members joined us on 11 October and were welcomed by Brenda. The minutes of September’s meeting having been approved and signed, details of leisure activities and invitations from other WIs were read out. Romaine gave an update of the situation regarding the ‘floral display’ in Alnwick. Our speaker for the evening was Jane Graham who gave a very lively and inspirational talk about her heart transplant. Jane had been suffering breathing problems and for 18 years had been misdiagnosed with asthma. 5 years ago she was told her heart was in a very poor condition and that a transplant was her only option. Finally after 3 false alarms she was given the heart of a 30 year old woman. We were told about all the work going on in the field of transplants and how important it is for people to consider agreeing to organ donation. A vote of thanks was given by Christine Yeaman. The evening’s raffle prize of a box of biscuits was won by Catherine Lister. Our next neeting will be on 8 November and on that occasion we will making decorative coasters. November is our last formal meeting of the year and nearly all our members were able to make it to this one, with just a few apologies. The minutes were approved and signed and an update was given on the WI exhibition. Special thanks were given to Romaine and Carolyn for all their hard work associated with this. This evening was a hands on affair and Becky (I did not catch her last name) who is a local crafter came along to show us how to make coasters. We were given very fine threads of man-made fibres in all sorts of colours and shown how to assemble them to create random patterns, or in some cases, specific scenes. The fibres were then placed between parchment sheets and lightly pressed with a steam iron. The results were very attractive. These have been taken away to be made into the glass coasters. Becky had also brought along some of her work for sale. Joan Sharp gave a vote of thanks. This evening’s raffle was on by Catherine Lister (again). In December we shall be meeting at the White Swan in Warenford for our Christmas meal. I do like a bit of cheese as Wallace and Gromit might say and cheese there was aplenty for Eglingham W.I. 's March meeting. Firstly, we had the business part of the meeting and it was good to hear that our fundraising efforts for our Centenary charity over the last year or so came to a total of two thousand pounds. This money was raised in memory of a past resident and member of Eglingham W.I., Fiona Robson. One thousand pounds will go to the Palliative Care Unit, Wansbeck and the other thousand to the Oncology Unit, Alnwick. This year the charity which members will be supporting is the Redbox North Northumberland which provides sanitary items for women/girls who experience sanitary protection poverty. There are three collection points in Alnwick where people can donate: Alnwick Infirmary, Sainsburys and Costa Coffee. Our collection will be taken in by Helen after each meeting. Arrangements were made for members to attend various W.I. meetings. The main one being the Spring Council Meeting in April held at The Royal Grammar School, Newcastle. On completion of all business, Brenda, our President, introduced our speakers for the evening, Andrew and Craig who worked for the Northumbrian Cheese Company based on the Blagdon Estate. Andrew gave us a little history of the company. It had been founded in the early 80s by Mark Robertson, of the famous jam family, who had started a sheep farm in Redesdale. He travelled to Europe and the Netherlands to learn about cheese making and converted a barn into a dairy. The move to Blagdon was motivated by wanting more footfall and the room to grow- and grow it has! They now boast sixteen artisan cheeses including sheep, goats, Jersey milk and cows' milk from the Blagdon estate. They work five days a week with two batches made each day. These are traditional, hand- made cheeses, quite labour intensive, for example, whilst the circular cheeses are maturing in their vacuum packs, they have to been turned once a week. As there are 13 thousand of them it is a full time job! Apart from the making of the cheeses, dispatch and selling can be very intensive if, like at Christmas, there were thirty thousand wedges to dispatch! That called for twelve hour shifts! The cheese is sold nation wide and as far flung as Australia. The company seems to keep abreast of innovative ideas as they have even made cheese wedding cakes with various tiers of circular cheeses with carvings of little mice! The company hopes to gain investment to extend their buildings and modernize their machinery. At the same time there is a wish to keep the company family based and workers (seven at the present time) to have the benefits of being shareholders. Then for the cheese tasting! Craig came around with piled plates of Redesdale (sheep's cheese) Nettle, Smoked, (both from cows' milk) and Elsdon (a mild goats' cheese.) Delicious! Neither the smoked cheese nor the goats' cheese were over-powering but a delicate flavour. The former is sent down to North Yorkshire where it is oak smoked – and no – Robsons at Craster, although local, would not be a good idea unless you wanted a kipper flavour! All the Northumbrian Cheese Company's cheeses have won gold awards over the years most notably at the famous Nantwich cheese awards. The Cheese Farm Shop and Cheese Loft Cafe are open daily and there are opportunities for dairy tours and cheese making. Top tips which you probably already know is to always get your cheese to room temperature to taste the full flavour; to keep your cheese in the fridge, wrap it firmly in tin foil and lastly, you can freeze it. The vote of thanks was given by Romaine. Ladies were given the opportunity to buy some cheeses and there was a great deal of cheese cubes left which were added to the supper table. Needless to say there was no sign of any cheese left at home time! A convivial supper ensued and the raffle was drawn. The next meeting will be on Thursday, 11th April at 7.00pm in Eglingham Village Hall. The speaker is Mary Wilkins who will be giving a cookery demonstration with tasters. There will be invited guests from other W.I.s but visitors are welcome. A large gathering assembled for our meeting on Thursday 11th April. Ladies from Lancaster Park, Hedgeley and Doddington WIs had been invited to join us on that evening. They were welcomed by Brenda who then went on to give her report on the annual council meeting which had been held in Newcastle on 6th April. When other formalities had been finalised our ‘speaker’ for the evening was introduced, Mary Wilkins. Mary, along with her husband, has for the last 15 years, been running a catering business as well as cooking classes and demonstrations from her home in Rothbury. She did her training, amongst other places, at the Dorchester and Savoy hotels in London. Mary has also worked with many of the top chefs. Whilst preparing the ingredients for the food she was about to cook Mary also gave us preparation tips. In about an hour she produced two dishes...Tuscan Panzanella salad with cod and Thai steamed mussels. Recipes for these dishes were available along with several items of kitchen equipment. Following a vote of thanks from Jane Hamilton, members were then able to sample both of the delicious dishes. It was then time for our usual wide variety of buffet food and the raffle. In 2018 Northumberland WI are celebrating their Centenary which means that there will be lots of celebrations taking place to commemorate this special time. Carolyn Brewster, one of our members at Eglingham WI, is compiling a number of very interesting articles, '100 things you may not know about Eglingham WI'. 1. Founded in Canada in 1897, Stanley Baldwin said the WI was ‘the greatest idea that has come out of the colonies to the Motherland’. 2. The first UK WI met on Anglesey in 1915, and in Northumberland, the first Institute was formed in 1917 at Heddon on the Wall. In the early days, their aim was to revitalise rural communities and to encourage women to become more involved in producing food during the First World War. 3. In Britain, the two most important criteria were that the WI should be a non-sectarian and non party political organisation. Although closely linked with the campaign for suffrage, the WI was primarily to be a women’s movement dedicated to ‘Home and Country’. 4. Eglingham and District WI was formed in March 1918 and was amongst the first 10 to be established in Northumberland. Eglingham Village Hall (then called the Parish Hall), had been built in 1914, and was a readymade home for their meetings. As with many other WI’s the founder member and first President, Lady Milvain, was also the Lady of the ‘Big House’ in the days when class and education inequalities were the norm. In working together, the WI helped break down these social barriers. 5. The Institute’s early activities were in support of the War effort. In June 1918, the local Alnwick paper reported that Lady Milvain had bought a potato spraying machine through the auspices of EglinghamWI for the use of villagers and tenants. At the same time, the Institute was also involved in saving and recycling paper which was collected at the village Post Office. 7. The WI was closed for the duration of WW2 and reformed in December 1947 by a Mrs Marshall. Unfortunately, little more is known about the early days as all the meeting records before this date were burnt. 8. A glimpse of WI life in December 1934 is given in a local newspaper report. 9. In 1937, to celebrate the coronation of George VI, an avenue of 152 Horse Chestnuts was planted on the Great North Road (now the A1) near Tritlington some miles north of Morpeth, one for every Institute in the county. A few have survived subsequent road widening schemes. As the month of its foundation, March is Eglingham WI’s time to celebrate. Birthdays are the theme of the second reflection on our Centenary. 11. In true WI fashion, every significant birthday has been celebrated with a specially decorated cake, in recent years, all crafted by our master baker, Brenda Robertson. Even at our monthly meetings, members go to a lot of trouble to prepare a tasty spread, and our delicious supers have become famous. Unlike some other WI’s who take their own mug and eat biscuits, we enjoy our tea in cups and saucers emblazoned with the WI logo alongside a fabulous supper spread on matching WI plates. 12. Stylish since at least the 1950’s, our President’s table has been covered in a specially embroidered cloth and a seasonal arrangement of flowers. The cloth was bought and then embroidered with the WI logo by a member in 1958 to commemorate the Institute’s 40th anniversary. It has survived 60 years with only a few patches. 13. Here is a list of significant birthdays. It is interesting to see how the food choices, music and gifts reflect fashions of the times. The ladies certainly knew how to celebrate! 1968 50 Golden Jubilee Party at Eglingham Hall, the home of Mrs Bewicke, whose mother had been the first President. Supper was provided by her and a film was shown to entertain Members. Mrs Bewicke offered a site in the village for a WI bench to commemorate the Jubilee. 1978 60 At their Diamond Jubilee party, Members invited other WI’s and the Hall Committee. Supper included ham salad, trifle, cakes and sherry followed by the birthday cake. Entertainment was provided by an ‘excellent concert party from Millfield’. The Hall Committee were presented with new stage curtains and a 60 piece china set. 1988 70 Meal at Percy Arms, Chatton for 13 Members and their guests. Three courses were followed by coffee and mints. When the entertainers failed to turn up, Members organised a game of charades. 1993 75 Party in Village Hall. Every Member received an engraved wine goblet in commemoration and each guest a WI teaspoon. 1998 80 Meal in Village Hall with Members from neighbouring WI’s and past Presidents. Hot and cold dishes served with salads were followed by a choice of deserts were prepared by outside caterers (Peter Allan, Wooler) and entertainment was provided by B&J McKinely on accordion and guitar. 2008 90 Party in Village Hall. Members and their guests, dressed in 1918 fashion, were wined and dined, and sang songs of yesteryear. Every member received a gift of a hand embroidered gingham lavender bag. 14. Both Eglingham and the Northumerland Federation of WI’s celebrate their Centenaries in 2018. In Eglingham, preparations for this significant and special event have been carefully planned by the Committee over the past year. An early decision was to offer an inspirational programme with all female speakers. 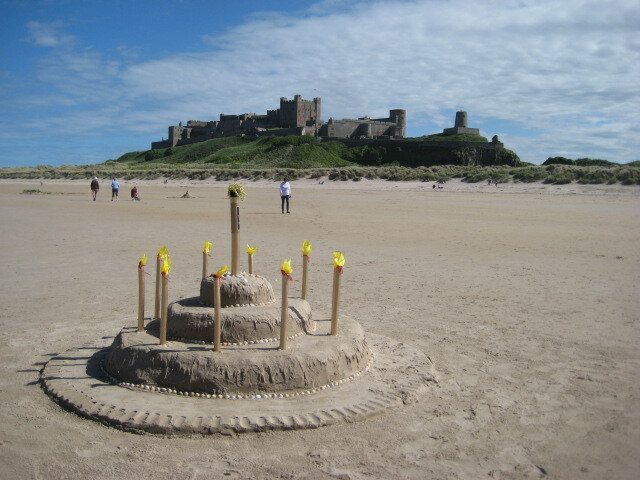 The Ossary at Bamburgh, the NE’s pioneering women’s struggle for votes, assistance dogs and an Indian cookery demonstration and tasting are some of the year’s highlights. 15. Two celebratory events have been planned for the year, one a Member’s only treat this month, with supper provided by caterers Fiona Burn from Berwick, and a quiz. Then, in May, we have invited guests from the community and other WI’s to join us for a supper prepared by members, entertainment provided by Magician, Paul Lytton, and a fund raising raffle for our two Centenary cancer charities in memory of our past Member, Fiona Robson. 16. Our archive, usually stored in a spare bedroom, has been invisible to most members. Two projects have emerged from the desire of the Committee to make the information more accessible. The first has been to research the record to provide the historical information for this series of articles in Hear Abouts, and also available to read on the WI page of the Parish website www.eglingham.info. 17. The other major Centenary project will be to create a large modern day quilt made up of 100 digital images reflecting the WI's past as well as its present. The 100 images will be selected from the WI's own archive, more recent photographs from Members, and a number of specially commissioned shots at this year's Centenary events. 18. Wall hangings have a valuable and longstanding place in the WI nationally, and this idea brings the tradition up to date. It will show case who we are as a WI and be a permanent, visible and accessible record of member’s interests, achievements and awards. 19. Although we acknowledge and value our past, we want to show that we are a modern WI with novel ideas and a future that will take us through the next 100 years. The costs of the banner has been funded through the Community Foundation from the Percy Family Fund. 20. The banner will be unveiled at Bailiffgate Museum’s WI exhibition in November 2018 celebrating the Centenaries of seven WI’s in the North of the county. After, it will be brought back to hang in the village hall, to reinforce our historical context and the significant place Eglingham WI has had and continues to have in the wider community. With the arrival of spring, this third reflection on our Centenary focuses on events around Easter and eggs. 21. There has been a long standing tradition in Eglingham to donate eggs for charity. It started during WW1, when Mrs Ormsby, the Bishop of Eglingham’s wife, appealed for fresh eggs on behalf of the National Egg Collection for wounded soldiers and sailors in London and the Pendower Military Convalescence Hospital, run by the Red Cross, in Newcastle. 22. Eggs are what we would now call a super food. Poultry World, who launched the appeal, said ‘every hen should be on active service’ and at a time when many people kept hens it was a way they could easily contribute to the war effort. Mrs Ormsby’s appeal raised over 100 dozen eggs. Special egg boxes were sent carriage free to London and back by rail, and donors were encouraged to write their name and address on the eggs with a message. 23. The local Alnwick newspaper correspondent was impressed with Eglingham’s efforts and, in June 1918, wrote ‘other country parishes might easily help the wounded this way’. 24. The WI was quick to pick up this initiative and when records begin again after WW2, collecting eggs at Easter time for various charities became an annual endeavour for almost 40 years until the mid 1980’s. 25. In the 1950’s, both fresh and dyed boiled eggs were donated, collected and delivered by Eglingham members for the Poor Children’s Holiday Association (PCHA), a charity supporting Stannington Sanatorium. This charity, which is now known as Children North East, is still supported by our wider community at both Easter and Christmas time. 26. During the early 1970’s, eggs were packed and sent by bus to the Prudhoe Street Mission, but by 1979, members decided to send the eggs locally to the Cottage Hospital, and in the 1980’s to Thornbrae Children’s Home (4 dozen in 1984), both in Alnwick. 27. In the 1970’s and 80’s, the WI organised successful annual fund raising Easter Fairs. Members brought their eggs for collection to the village hall, and for the last two years, the eggs were only sent fresh. 28. Dyed eggs were prepared in various ways. One method, remembered by past member Enid Grahamslaw, involved pressing small flowers against the egg shell, then wrapping with a colourful fabric and finally using wool to hold it all in place whilst the egg was boiled. The dye would run from the fabric to stain the egg shell leaving only the shape of the flower the original colour. 29. The WI nationally offers a unique role for women to campaign on issues that matter to them and their communities, and spring is the time the National Federation’s of WI vote at their Annual Meeting on which resolution to select for their next campaign. Each year, members have the chance to put forward issues they want to raise awareness about. Successful resolutions become mandates that form the basis of campaigns and educational activity. 30. In 2011, Eglingham member, Dr Penny Garood, proposed a resolution ‘Reducing Rural Fuel Poverty’ which was chosen to be shortlisted for consideration by the national membership. There is a strong link between fuel poverty and being off the gas grid which disproportionally affects rural homes. Unfortunately, although it is an ongoing problem, which has worsened as fuel prices have risen, members were very disappointed when it did not receive enough votes for it to be the successful choice. Our fourth delve into the WI archives focuses on the important link between the WI and its home, Eglingham Village Hall. 31. Like many other WI’s, Eglingham has a close relationship with its village hall. Over the years, members have helped improve facilities, raised large sums of money and been involved in its management. 32. Except for the WI’s suspension during WW2, and at other times when, for various reasons, the meetings took place in the school, the pub, member’s houses or other adjacent village halls, the WI has been the Hall’s longest regular user. 33. When the WI reformed after the War, the burning issue was the lack of heating. When the Hall was first opened in 1914, the only heating was an open fire. In the 1950’s, after the Hall Committee didn’t responded to their request for more heating on meeting nights, members took matters into their own hands. They asked an electrical company if they could have convector heaters on approval (which were supplemented by ‘sausages’ for the doors made by members). In 1957, they bought the electrical heaters and then decided to erect a door at the foot of the stairs leading to the stage to help prevent drafts. A bring and buy sale was organised to help fund the improvements. However, comments about heating continued to be the most frequent complaint for winter meetings, with members having to leave on their outdoor clothing to keep warm, until only around the time of the hall’s centenary, 2014, when a new effective heating system was installed and the Hall was properly insulated. 34. Initially, issues raised by the WI were sent by letter to the Chairman of the Hall Committee, but by 1958 records show that the WI had its own representative, a Miss Isa Wilson. This association has become even closer over the years; with the WI maintaining at least one official seat round the table. In our small community, other Committee members have often also been WI members. 35. As well as supporting the management of the Hall, the WI has raised significant sums of money for various appeals. For more than 50 years, the WI has organised Whist Drives, Concerts, a Fashion Show, Coffee Evenings, Christmas Fairs, and sponsored events including darts and a walk. It also made one off donations from its funds for specific projects, and contributed numerous raffle prizes. In 1961, a significant debt of £700 was reduced to £300 helped by the generous support of WI members. More recently, there has been less pressure to fund raise as sums of money became available from the local authority, lottery grants and then significantly from the Community Wind Farm Fund. 36. The WI has also gifted specific items to improve the comfort and facilities in the Hall. In 1954, the WI President, Mrs Grant, asked the Archdeacon, who chaired the Hall Committee, for permission to buy new stage curtains and fit a proscenium arch, and then held a Whist drive and concert to raise the money to pay for them. Then, as part of their Diamond Jubilee preparations, members agreed to donate another new pair of stage curtains for the Hall. Mrs Bolam ordered them from Binns in Newcastle after the money had been raised and the President, Mrs Gregory, presented them to the Hall Committee at their 60th birthday celebrations in March 1978. At the same time, the WI also gifted a 60 piece crockery set. 37. In the early 1960’s, members asked the Archdeacon if they could put up a darts board. There is no record of the team’s achievements, but then in the early 1990’s another request was made to put up a new board. This time the four team members entered the Northumberland WI Federation’s knock-out darts competition and won four years in succession. Eglingham members also hosted knock-out rounds of the county Federation’s domino competitions in the Hall. 38. Since the 1950’s, the archives show that the WI has also regularly offered to help keep the Hall tidy participating in cleaning and caretaking rotas. 39. In recent years, their stall at the Hall’s Christmas Market has generated around £600 and is now the main WI annual fund raiser. This is shared between supporting WI activities and their nominated annual charity. 40. Thanks to several years of dedicated work by volunteers on the Hall Management Committee, the first meeting of the WI’s Centenary year with a talk on Bamburgh’s new Ossary, was held in great comfort in the newly refurbished hall with a convenient hatch into the kitchen and with all the advantages of a state of the art multimedia system. The WI has had a long tradition of fund raising in the community, and this fifth reflection explores the archive for evidence of their achievements. 41. Annual subscriptions paid by WI Members have to be supplemented to pay for speakers and hall hire. The first record, in 1918, of the newly formed WI raising money for their own funds was a Ball in the Village Hall which netted £10, and dances continued to be a popular and important way of raising money. Members have also donated occasional payments to the Northumberland Federation of WIs and the WI’s residential college, Denman, in Oxfordshire. Members also had their own Savings Group which was started in 1958 by former secretary, Dorothy Little. Six years later, they had an impressive total of over £1000 in their accounts. 42. Careful financial management by our Treasurers’ over the years has enabled the WI to satisfy its own needs and then use its expertise to organise events to raise significant sums of money in support of other causes. As a charity, the WI can only support other causes that fall within its own objectives. So, in addition to the large sums raised for Eglingham Village Hall (benefiting the local community), the WI has contributed to providing facilities and equipment at local hospitals (advancing public health), and bursaries for young women to further their studies (education). 43. Fund raising events have reflected the fashions of the time, but some annual appeals for the Red Cross and Coins for Friendship, which helps women in the developing world, have remained perennial favourites. 44. Popular between 1950 and 2000 were bring and buy stalls, coffee mornings and evenings, whist drives, dances and concerts. Between 1950 and 1970, the WI had, at various times, an Entertainment Committee, a Choir, a Drama Group, and a Skiffle Group! Later, in the 1970’s and 80’s, concerts with sketches and songs entertained the Senior Citizens at Christmas time with funds raised from their annual Christmas Fayre. Raffles have and continue to be the mainstay of fundraising efforts, featuring at every monthly meeting. In the 1980’s, there was even a ‘Raffle Official’ on the Committee. 45. Annual fund raising efforts also relied on established events. For years when it reformed after the Second World War, the WI organised Easter Shows and Spring and Christmas Fayres. A scone stall at the Chillingham Vintage Vehicle Rally ran for 19 years from 1994-2013, and a Wayside stall in Eglingham village was organised outside the Tankerville Arms for many of the years between 1966 and 2014. The first stall ‘received the support of all’ and raised over £8. In 2001, it was recorded to be ‘an excellent way to make money.’ However, an outside stall was always a risk during British summers, and there were several years when it had to be cancelled because of bad weather. 46. Over the last few years, the major fund raiser has been an indoor stall at the Eglingham Christmas Market. Orders for Christmas cakes, mince pies and meringues have been very popular, and on the day sales of jams, jellies and other Christmas treats enable the WI to share the significant profits between themselves and their nominated annual charity. 47. After a talk by a representative of Send a Cow (to Africa ) in 2010, Members decided, as a personal gesture, to send a donation to the charity instead of exchanging Christmas presents. This has now become an annual tradition with some Members also donating an additional sum in lieu of sending each other cards. Recent donations have favoured local charities. 48. There are many examples in the archives of the WI responding to specific appeals. As well as their generous contributions to Village Hall restoration funds, in 1953, it contributed £20 to Eglingham village’s Coronation Fund which raised money for a celebratory concert and dance. A raffle supported Romanian Children and a bring and buy raised £50 in 1990 for Dr Roy’s Indian appeal. Recently, Members made a donation to the Stephen Carey Fund after the charity had helped install defibrillators at Eglingham and South Charlton Village Halls. 49. Medical charities, especially those involved with cancer, has been firm favourites with Members over the years. Year of the Disabled, Northumberland Day Hospice, Alnwick Hospice, Breast Cancer, Arthritis and Rheumatism Research, and Air Ambulance are a few examples of charities to have benefited from the fund raising efforts of Eglingham WI. 50. This year our chosen Centenary charities are in memory of our former, and much missed member, Fiona Robertson, who died, too young, in 2017. During 2018, we hope to raise a significant sum to donate to the Oncology Unit at Alnwick Infirmary and the Palliative Care Ward at Wansbeck Hospital. The WI has very close ties to the community and our sixth delve into the archive explores the work it does to promote community cohesion. 51. WI’s are embedded in their local communities and this is even more so where, like Eglingham, the WI is small and the community rural and sparsely populated. 52. Apart from their near continuous backing for Eglingham Village Hall, the WI has chosen to support other endeavours which have enhanced or promoted community life. Selected here are some examples of the WI’s activities which have brought benefit to and had a positive effect on the wider community. 53. In 1934, the WI’s national AGM passed a resolution asking for improved water supplies in villages. The summers of 1932 and 1933 had been long and hot, and the sources in wells and streams in villages around the county had dried up. To support the need for improvements, WI’s throughout Northumberland undertook a water survey, and the results were published in the WI magazine Home and Country as an example to other County Federations. 54. Eglingham WI has a tradition of marking major events by planting commemorative trees. For the Golden Jubilee of the (national) WI in 1965, two cherry trees were planted, one in front of the Village Hall, and the other on the opposite side of the road in the corner of a field at Village Farm. Together, they provide a stunning display of pink blossom arching over the road in the spring. The press photo shows WI President, Mrs Grahamslaw, planting the tree at the Hall on the afternoon of the children’s Christmas party, and watched by other members. 55. In 1965, the Committee began to think about how they were going to mark their own Golden Jubilee in 1968. At this time, many Members who lived outside the village came to meetings on the bus, so they decided to provide a seat at the bus stop opposite the shelter in front of the school. A wooden bench was ordered from Scott’s ironmongers. It was vandalised in 1979, and repaired by Mr S Woodcock, but by 1985 it had deteriorated so far that it was beyond repair. So, to mark their Golden Jubilee, it was agreed to organise a more substantial replacement. Mr Dickinson of Kirknewton was given the job and Members raised the money to pay for it by holding a coffee evening and film show. The bench ends have the letters EWI crafted into the metal work. The press photo shows Members after they had attached their commemorative plaque. Further restoration work was carried out in 2014 by David Robinson (Sneck) with oak kindly donated by Andy Scott. 56. In European Conservation Year 1971, the WI planted a Copper Beech in the churchyard. Planting a tree to celebrate major events makes a long-lasting and vibrant memorial as trees are an integral part of the character and identity of the village. This tree in the SE corner of the church yard is now a magnificent specimen. As their contribution to the Queen’s Diamond Jubilee celebrations in 2012, the WI paid for and then helped plant Daffodil bulbs along the main path from St Maurice’s church gate. 57. In 1994, the Northumberland Federation jointly published The Northumberland Village Book with Countryside Books. It was one of many in the Villages of Britain series. Heather Gregory, latterly of East Lilburn wrote Eglingham WI’s contribution with information provided by Enid Grahamslaw. The many various aspects of life, past and present, which gave each village its individual character, are included with the advantage that the authors knew and loved the subject they were writing about. A full transcript can be found on the WI page of the parish website. 58. When public access defibrillators became widely available, the WI decided to facilitate the funding and installation of machines at Eglingham and South Charlton Village Halls. Under the auspices of the Parish Council and with the help of both the Stephen Carey and Middlemoor Community Windfarm Funds, the defibrillators were installed in March 2015, and community training followed soon after. These potentially lifesaving machines significantly increase the survival rates following a cardiac arrest as the quicker the intervention the better the outcome, and are a really significant asset to our rural community where it can take much longer for an ambulance to arrive. 59. In recent years, one of our annual monthly meetings has been open to the community with the Programme Secretary choosing a speaker to appeal to a wider audience. Here are some examples: 2018 Canine Partners; 2017 Air Fighting in WW1; 2016 Jewels for a Royal Occasion 2015; Archaeology talk followed by site visit to Bradford Kaims , and 2014 RAF Boulmer talk followed by visit to their base. Selected WI trips have also been offered to family, friends and the wider community. Recently, two enjoyable and informative visits have been made to A&J Scott’s wood yard at Wooperton and Hutton Stone near Berwick. 60. Our Centenary project is to create a large modern day quilt and which will hang in Eglingham Village Hall and will be a visual showcase of the significant place the WI has had in the wider community. Eglingham is classed as a Small Institute and this month’s dip into the archives focuses on the Members – a diverse group of women who come together for communal activities, friendship, fun and camaraderie. 61. In 1958, there were 44 Members which the minutes note ‘considering the Institute relies on a scattered population and a depleted bus service this is indeed an effort’. In 1965, Membership peaked at 45. When bus times changed again in 1973, membership dropped to under 20 and in 1990 to an all time low of only 10. In the last 7 years, our numbers have increased significantly, and in our Centenary year, we have 31 members- over 50 years since there were so many. This is a significant achievement as several WI’s in our area have recently closed. Joan Sharp, in her Secretary’s report in 2012, said ‘I think our varied programme, together with a friendly, and “open house” policy, is the key to our success.’ Many women join when they are new to the area as the WI offers quick access into the community. Our longest serving member to date was Amy Dickson, from Beanley, who celebrated 60 years in the WI in 2007. Brenda Robertson celebrated her 40th year as a Member in 2017, serving 26 of these years as President. 62. When the Institute began, Members were encouraged to think of themselves as ‘sisters of the movement’ whether Lady of the Manor or farmer’s wife. It gave many women their first experience of democracy. Several local families have supported the WI over many generations, the Grahamslaws, Pringles, and the Wilsons to name a few. Teenagers could join from 17, but in 1975, it was agreed to accept Juniors from age 11, and several Member’s daughters joined in the years up to 1996. Baby cards were sent to Members from 1964 till the 1980’s, and from 1959 Members gave Christmas presents to Senior Citizens, but in the early 1990’s realised, as the demographics of the area changed, that they were ‘all over 60’ themselves! 63. With nearly 40 Members in 1960, there was a Management Committee, an Entertainment Committee, a Savings Collector, a Choir, a Handicrafts Secretary and a Press Correspondent. In addition, Miss Wilson offered to take members for drama classes. In our Centenary year, we have a President, Vice- President, Secretary, Assistant Secretary, Treasurer, Assistant Treasurer, Programme Secretary, Press Secretary, Web site manager, and Archivist. Our Assistants allow for the flexibility of a job share which suits our Members busy life styles. Committee meetings were held monthly until the 1990’s when membership was at an all time low. During these years, business was conducted at the start of the monthly meetings or once or twice a year by the Committee as required. With rising numbers in 2012, the Committee reformed and again meets monthly. 64. Eglingham WI Members have always come from the village, and although the majority have come from within the parish, we also attract women from much farther afield. Currently, Members come from Alnwick, Chatton, Haugh Head and Lowick. In the 1970’s and 80’s, our Treasurer Mrs Green, came from Turvey Law and then Yearle near Wooler. In our Centenary year, we welcomed a new member, Jackie Garrood, who lives in West Yorkshire! Members. They left Eglingham for Bolton (a distance of 7 miles), and were helped on their way by car drivers. A display of crafts was set out at the Church Fete that same year which attracted much attention with people wanting to buy, but unfortunately the items ‘were not for sale.’ During National and County promotional events in 1997 and 2009, Members invited friends and visitors from the community to special meetings. Eglingham Village Show in October 2012 provided another opportunity for the WI to showcase their skills, and promote the Institute. 66. Today, we have embraced the opportunity technology brings and recently the WI has gone digital. In 2011, we switched to email to keep Members in touch with events. It also means that Members who can’t attend meetings don’t miss out, and has significantly reduced business time. Social media is a great, and free, way to share news, photos, and experiences as well as promoting events and encouraging new Members. Some Members are on Facebook, and the WI page on the parish website allows us to advertise our Programme and make our archive accessible to all. WI’s come in all shapes and sizes, and in Eglingham we continue to evolve offering women the opportunity to join and be involved in the way that suits them best. 67. Coming together with our neighbouring Institutes and enjoying spending time with them at their meetings has always been a regular feature of the WI annual calendar. From the 1950’s, Bolton was our Link Institute until 1967 when it changed to Chatton. Both of these have since closed. Currently, we are linked with Hedgeley, Rodham and Chatton. This arrangement allows one delegate in rotation to go to the national WI AGM and then report back to the others. Since the 1960’s, Eglingham has been part of the Cheviot Group of WI’s. Previously, including Wooler, and the only recently closed Whittingham and Glanton , the Group now has four members: Doddington, Eglingham, Hedgeley and Roddam. These neighbouring WI’s come together for a special speaker, usually once a year, taking turns to host the meeting, but sharing the organisation between them. 68. County Federation competitions have also brought Members into contact with other WI’s from further afield. Over the years, Eglingham has entertained visitors from all over the county and from as far away as Tynedale. In 1964, Eglingham also entertained 10 other Institutes during the year of ‘Getting to Know You’. In the 1960’s and 1970’s, it wasn’t unusual for a monthly meeting to have as many as 30 invitees from other Institutes. 69. In 2013, Northumberland WI’s were encouraged by their Federation to twin with another in the county. Eglingham chose Lancaster Park in Morpeth to give a good contrast of experiences. We exchange programmes and meet up at least twice a year for meetings at each Institute, and have enjoyed their company and learnt from sharing experiences. 70. In the past, our links have extended even farther afield. A food parcel was sent to Eglingham WI from Australia in 1949 which Members drew lots for. At the (national) WI’s Annual Meeting in 1958, one of the speakers promoted the idea of linking up with Institutes abroad to encourage friendship through the world. Choosing Australia, Eglingham WI had a link with the Associated Country Women of the World for about 20 years from the 1960’s to the early 80’s. Blackbutt is on the east coast just north of Brisbane in Queensland (New South Wales) and the archive records exchanges of letters and occasional Christmas gifts of calendars and tea towels. October is the month when the Programme Secretary is finalising the speakers for the following year. This dip into the archives takes a look at 100 years of talks and trips and the educational and leisure opportunities they provide. 71. The Programme of meetings is the mainstay of the WI’s annual calendar. It aims to have a variety of activities and speakers on offer to reflect the wide range of Member’s interests. The Programme has a unique role in offering women educational opportunities, the chance to build new skills and take part in a wide variety of activities. 72. Over the years, the mix of talk topics has remained broadly the same, but there has been a noticeable change of emphasis over the decades. In 1918, when girls left school at 14, the main focus of the talks was designed to reinforce traditional skills. Then after the war, continued austerity shifted the emphasis to make do and mend. Talks supporting all the new household gadgets became a feature in the 1960’s and 1970’s. Also, at this time, Members were exposed to the opportunities for foreign travel with slide shows from around the world. This century, talks on a range of environmental matters often featured on the Programme, and in our Centenary Year, we have heard how women in the North East campaigned for the right to vote. 73. The timeless themes of the Programme are all kinds of arts and craft (especially flower arranging, and Christmas decorations), cookery (anything to do with cakes and their decoration), travel, local history, fashion, health and local charities. Recurring talks are from the police (sometimes with their dogs), from Turnbull’s butchers (always bringing a piece of meat for the raffle), and journalists from our local newspaper the Alnwick Gazette. Every year, there is at least one Hands–on opportunity for members to have a go making something for themselves. In the printed programmes in the 1960’s and 1970’s, each month’s talk was charmingly accompanied by a relevant quote. 74. There are some stand out talks with enticing titles, but sadly the Minute books rarely give any clues about the contents. Potentially politically hot topics were talks onPalestine in 1947, and the Dangers of Atomic Warfare in 1961. Some reflect serious social issues such as a talk on Child Abuse in 1989. Other just make you wish you’d been there, such as talks in 1960 entitled Humour with a Midwife’s bag and in 1965 Missionary Work with Red Indians. In 1955, the Programme Secretary must have had been well connected as talks that year included Lady Tankerville on Chillingham Wild Cattle, and Lady Trevelyan on the Life of her step sister Gertrude Bell. However, it has taken 100 years for the Programme to embrace the exotic world of spices and curries! 76. In the early days, as most Members were dependant on public transport, and travel was limited to a holiday in this country, the annual Summer Trip organised by the WI was very popular. The Federation organised continental holidays until the 1980’s when they were replaced with cheaper county day trips. In 1967, Bolton WI joined Eglingham Members and friends for a day trip to Holland’s bulb fields. For years, Members hired a coach and set off with husbands and friends for tourist destinations in the North of England and Southern Scotland. In our Centenary year, for the first time for a while, we hired a coach again and enjoyed a day trip to Dalmain in Cumbria. Local visits organised closer to home are also an established annual treat. Trips to theatres in Berwick and Newcastle, the BBC, and visits to craft outlets and private gardens have all featured. This year we are off to see the newly restored Lindisfarne Castle, with lunch at the Barn at Beal. 77. Members Night has been a regular feature on Programmes since the mid 1970’s. Up to the 1980’s, Members came prepared to give a talk, or provide a short entertainment. Successful names were drawn out of a hat. Recently, this monthly meeting has been use as social time or to discuss ideas for promotions or fund raising events. Occasionally, monthly meetings have been held away from the village hall. Tours around Pumphrey’s coffee, Trotter’s Bakery and Spurrelis Boutique ice cream have usually ended with Members enjoying a delicious tasting session. In some of the years between the 1970’s and 1980’s, meetings were held at Ravenslaw House in Alnwick where Members enjoyed cookery and gardening demonstrations. 78. The Social Half Hour was part of every monthly meeting for over 30 years from the 1950’s to 1980’s. Later, in the 1990’s, social events were only organised when there were visitors. After the War, when life was really hard, and there was nothing much else to do Members made their own entertainment. Member in the late 1950’s, Mary Laycock, then in her early 20’s and who played the mouth organ in the WI Skiffle Group, remembers that the social time was a ‘form of escapism’ and all about having ‘fun and a good laugh.’ The entertainment was diverse: drama and comedy sketches, Scottish dancing, sing songs, films, recitations, quizzes, whist and beetle drives, and bingo. Games were also popular with charades; pass the parcel, musical chairs and word and picture guessing games being the favourites. 79. For about 20 years from 1950-1970, the Northumberland County Education Committee supplied lecturers for evening classes in the village hall during the winter months. Eglingham WI Secretaries applied every year for a different class. Scottish dancing was popular but other classes focussed on crafts from basketry, rug making, millinery, china painting and pewter works to all kinds of sewing skills. Then and now, Members are entitled to join courses organised by the county Federation at Cresswell House. These support the training of Committee Members, as well as leisure topics. International Day, an annual event, is very popular with Members. 80. Denman, the WI’s own residential adult education college, which opened 1948 in Oxfordshire, offers short term residential learning. Eglingham Members have attended courses sometimes with help from bursaries offered by the county Federation and in the 1980’s from a separate bursary set up by Eglingham WI. Now the subject of an ongoing appeal for the future maintenance of its building and grounds, Eglingham Members recently agreed that, although they wished to see a continuation of the courses on offer, they would prefer if available funds were used to provide the same opportunities on a regional basis making them more accessible and affordable. As a result, they have declined to support the fund raising. The idea for a more local opportunities wasn’t new as something similar was suggested in 1980 when several foresighted Members were interested in a ‘mini Denman’ at Kirkley Hall. WI has always had creativity at its heart. This month’s dip into the archives takes a look at how competitions have helped maintain traditional crafts, as well as offering the opportunity for members to engage and challenge themselves with new endeavours as either individuals or working as a team. 81. Competitions at their monthly meeting give WI Members the opportunity to develop their skills and compete on an informal basis. Like the talks programme, competition themes in the early days tended to reinforce domestic skills. There was rarely a link with the talk except at Easter time when the competition was always for dyed eggs. In recent times, monthly competitions have been themed to reflect the talk or the season. Serious themes around real skills have been mixed with fun entries. Sadly, there are no photographs of Hats made from kitchen utensils (1963), a Potato peeled blindfold (1981) or a Decorated Asprin (1989)! 82. However, the archive reveals that these monthly competitions have never been very popular in Eglingham. Various tactics have been employed over the years to try and increase the number of entries. In the 1950’s, they tried alternate months and introduced a cash prize instead of awarding points. The post of Competition Secretary was created in 1963, and the points system was reintroduced. A cup was bought in the 1980’s for the monthly winner and plaques for the top 3 annual winners to keep. In 2011, Jean Findlay suggested having only 4 a year to allow for the various skills of entrants and ‘enabling the judges to select winning entries in a fairer manner and hopefully engage members in a more enjoyable way.’ In 2011, the competitions were split into two categories Made by You, and Pick Up, but all to no avail. 99 years after its formation in 2017, the competition became an annual event – but even that has not proved popular! 83. The main annual prize for the monthly competitions from 1974 until 2012 was the elegant Rose Bowl which had been presented to Eglingham in recognition of their success in 1923 and 4 at the Alnwick Industrial Show. The band around its base, engraved with the names of the winners, shows only 4, with Brenda Robertson’s name appearing 18 times. Brenda has maintained her reputation as competition supremo winning every year since, and now holds the cup in its retirement. 84. Over the years, Industrial and Horticultural Shows have proved to be more popular with Members. Mrs Ida Pringle said in 1964 that she ‘particularly enjoys the cooperative efforts for show exhibits.’ The Alnwick Flower Show was the main event. Entries were submitted by Eglingham for 20 years from 1948-68, then again from 1978-87, and occasionally in the following years until show closed in 1995. It was unusual for them not to be well placed, and 6 times in the 1960’s they won the Lockey Cup awarded to the best exhibit from a Small Institute. Over a similar period, Members also won many prizes at the Wooler Show, and also occasional entries to Glanton Flower, Chatton and Longhoughton Shows where they came away with cups, shields and monetary prizes. 85. Every year, the Northumberland Federation organises a County Day in different venues. It is usually well supported and in some years there have been as many as 50 cooperative entries. Every WI entry is awarded one of three certificates, and Eglingham has always done well gaining many 1sts. In 1959, Eglingham Members won 2 gold and 3 silver stars (Molly Wilson for a quilted cushion). Brenda and Evelyn Sinclair have also won many prizes for both craft and baking entries, including a cup to Brenda for the best craft exhibit (a smocked apron). At County Day in Wooler in 2011, Members came first in the Cooperative category and won the cup. Individual members also won prizes; Jean Findley for her photography, and Joan Sharp for her bread. Joan also won the Cresswell Tart Competition and later said ‘I didn’t stop smiling all day’. 88. Teams first competed in the Car Treasure Hunt in 2011. After entering for 3 years, Members worked out the form and won in 2015 and 2017 enjoying an interesting way of getting to know the back roads of Northumberland. Sadly, as winners, we couldn’t offer to organise the following years because of the lack of sufficient parking in Eglingham. 89. Members have joined in other competition over the years. There were 2 indoor bowls teams in 1976. Members came third in a poetry competition in 1989, and got through to the finals of a choral speaking competition in 1999. Although members have reached the finals of the Federation Quiz several times, including in their Centenary year, they have not yet managed to win. 90. For several years, the Northumberland Federation organised a day competition which was held centrally at the 18 hole Bellingham golf course. Long time Member and golfing expert, Jill Archer, beat all other individual entrants and succeeded in winning the Mary Newman Golf Trophy for 3 consecutive years (1999-2001). For many years, Christmas was the most important season in the WI calendar. In the 1980s, when there were less than 15 Members, they organised treats for children and Senior Citizens, a Christmas Fair for the whole community (with Santa’s grotto) and their own party in the Village Hall. 91. In their first year after reforming, Members decided to organise a Christmas party for the children of Eglingham and district and it became an annual event for over 40 years. Until 1976, the party was held in the Village Hall which was decorated for the occasion with a tree donated by a local landowner. Each child received a present – chocolate and fruit in the 1950’s, and in the 1960’s and 70’s, members went shopping in Berwick and Newcastle for gifts. Those who couldn’t go in 1961 received a 5s/6d saving stamp. 93. Members managed a list of eligible children. In 1950, they agreed the minimum age limit should be 2, and that Members without children could invite 2, and with one child one more. This was when there were approximately 35 invitees. As numbers rose, they controlled numbers by introducing other restrictions. In 1967, only under 12’s were welcome. Even so by 1971, they were entertaining over 90 children! By 1976, few members had young children of their own and the Junior Members were asked to help out. 95. Ten years after establishing the Christmas tradition for children, Members decided to treat the ‘elderly in and around Eglingham’ as well. This took the form of a gift. In 1959, it comprised 1/2lb of butter, 1/4lb of tea and 2 lbs of sugar. In the 1960’s, the over 65’s received either a bag or 2 of coal or logs depending on their relative costs. In the 1970’s, it was usual for the logs to be bought from Scott’s wood yard. It was quite an operation and husbands and friends were called in to help! A tractor was needed to collect the wood, help was needed to bag them up and then they had to be delivered. Food parcels and flowers were also offered as alternative gifts. Annually, the Committee had to maintain a list of eligible senior citizens, and review the area of benefit. 97. Santa Claus was a favourite with the children at their parties and in later years at the Christmas Fairs. In 1967, the WI bought material to make him some new clothes. These were borrowed by both the school and the play group. Rumour has it that one occasion one of the children noticed that, coincidentally; Santa had the same shoes as their father! On other occasions, when Santa was busy, Mrs Claus came instead. 98. Members have also organised their own entertainment around the December meeting night. Christmas social evenings with Members and friends enjoying a whist drive, supper and dance started in 1951. In the late 1950’s, they became more adventurous and treated themselves to a meal and a cinema visit. In 1957, they went to Newcastle for a Christmas dinner and then saw Round the World in 80 Days at the Queen’s Cinema. In the 1960’s, they chose to go for meals in local pubs in Cornhill, Wooler (Black Bull), and Chatton (Percy Arms). 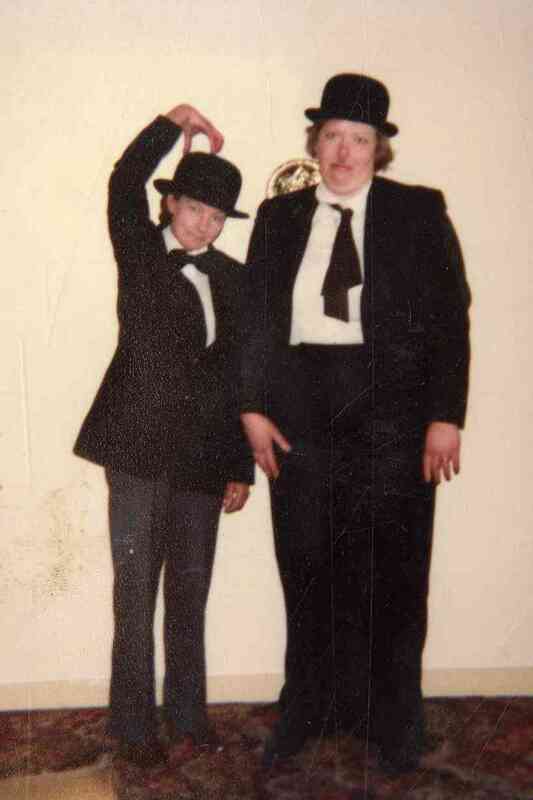 In the 1970’s, Dinner Dances became the favoured entertainment at either Wooler’s Red Lion or the Tankerville Arms. Christmas parties were held in the Village Hall in the 1980’s with invites to husbands, friends and the Bowling Club. A buffet (provided by members), was followed by games and dancing to taped music, ending with Carol singing. The Percy Arms hosted most of the Christmas meals in the 1990’s and the Tankerville Arms in Eglingham and Cragside in the 2000’s. This decade, Members have again travelled further afield celebrating at the Cook and Barker (Newton on the Moor), White Swan (Warenford), and Carnaby’s (Brownieside). In other years, we have been at the Tankerville Arms in the village memorably in 2015 when Mellow Morrison entertained us with his guitar and song. 99. For 30 years, all the favourite means of fund raising were employed (whist drives, raffles, coffee evenings and dances) to raise money to fund the Christmas treats. Then in 1978, Members had the idea to have a Christmas Fair. They agreed to make inexpensive gifts, crackers, order a Santa’s Grotto and bran tub, and organise a raffle and serve teas. Fairs continued to raise money for the treats until 1990, then after the proceeds were split between WI funds and a nominated charity, finally finishing in 1998. Recently, the Christmas Fair was revived by the Village Hall Events Committee, and since 2015 the WI have taken tables to sell their delicious homemade treats. This has taken over from the Wayside Stall to become the WI’s main fund raiser of the year. 100. Since 2015 and just before Christmas, Eglingham has organised a collection for the Changing Lives charity in Newcastle who support some of the most vulnerable and excluded people in our society.